I have been working on lots of projects around the house recently. Some of these have been ongoing for a while, like my house caulking. I have a two story, unique architectural house, meaning an architect decided to do a run of 4 houses (along my street) which were designed for the Pacific Northwest (using California styles which leads to some interesting choices). Needless to say, there are some quirks with a unique house. We have a couple large skylights that make working on the second story challenging in places. That aside, the previous owners appeared to do a good job of keeping the house up but in the last few years of their ownership things started to slide as illness impacted them. One of those was the siding. The second story in particular has not been caulked in forever and it has been a while since the last coat of exterior paint. This is showing with large gaps in our vertical slate wood siding. So, I have been removing old caulking and replacing it with new caulking. This is a labour intensive and time consuming process. And to get an idea of the scope of this project, I am 24 tubes of caulking into the front of the house (2 stories) and I am not finished yet. Today I picked up another 24 tubes of caulking so I can continue this project. Now, you may be asking yourself, why am I doing this myself? Well, a couple reasons. We are a single family income at the moment, for one. But before I quit work I was doing this project, so there are other reasons. For one, I enjoy the satisfaction of working with my hands, bringing value to my house, gaining a sense of accomplishment that I am making our house last longer, stay warmer, and be more efficient. So in truth I am doing this for my own personal gratification. That's not to say I have not cursed this house and it's siding more than once. Then again, I would curse any other house that I had to do this for. When you own a house you either curse it as you do the work yourself or you curse the cheque you write when you pay 3+ times more to have a contractor come in and do it. Now you may have asked yourself, should I go for a Power or a Manual Caulker. Well, I have tried both and am full of opinions. I used manual for years and I thought with this huge caulking project I would try a Power Caulker, since Power means faster and better right? Meaning more time for other projects, Xbox, guitar, etc. I can caulk a longer line without needing to pause to resqueeze the handle. There is less squeezing meaning easier on the hand. In theory it is faster to go through a tube. I find it hard to stop the thurst fast enough so I end up with a lot of wasted caulk coming out the end. Due to the waste I feel like it takes longer to caulk but I never measured. I feel I am cleaning up more. With battery can be heavy. The kicker: It died after about 12 tubes. I used the Ryobi 18-Volt Power Caulker from Home Depot. I do not recommend. Dirt cheap and no batteries. A better grip strengthening workout. Can get it dirty as sin and not care since it is dirt cheap. A better grip workout means your hand gets tired faster. I started at about 4 tubes before my poor programmer hands were exhausted. I am now up to 7 tubes in one go. More frequent stops to resqueeze so you can continue your line (or bead in caulking lingo). 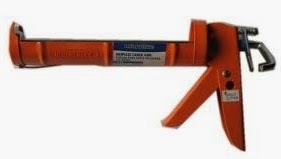 So for my money, I would stick with the Manual Caulking gun. I like the plain metal ones with no frills. Frills are for dresses, this is manual labour. I am currently using a Workforce 60:25 thrust ratio (I can not believe these have ratings but makes sense) that I got at Home Depot. As a bonus, I am building grip strength so I can shake hands better with Used Car Salesman.